The sign GO GAI has therefore the value 161 in the code table, as you can easily recalculate. Nowadays, however, the so-called Unicode has prevailed, describing characters with more than 8 bits and therefore almost unlimited, provides many characters for all languages of the world. For a Unicode character add the constant value 3424 to the ASCII code. The replacement should not take place if the consonant has a vowel already: otherwise it will result in . The replacement by alternative existing codes, we should, however, be left to the used programs. They will replace it on the display only and left the stored code unchanged, so that other programs also can use it to work correctly. 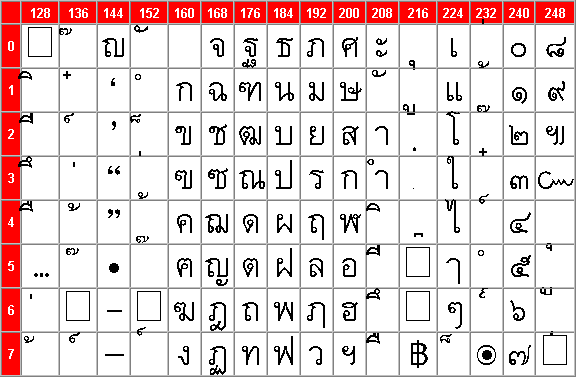 The following table shows the proportion of a character set that contains the Thai character. The numbering of rows and columns refers to a non-Unicode character set, in which the characters are placed in the upper half of the 1-byte ASCII code. The address of a character (and hence the code) can be determined by adding the row and column value. For a Unicode character is also added the constant value 3424 (decimal).